Hon. Bashir Adamu, popularly known as Jumbo in Jigawa political circle is a household name in the state. 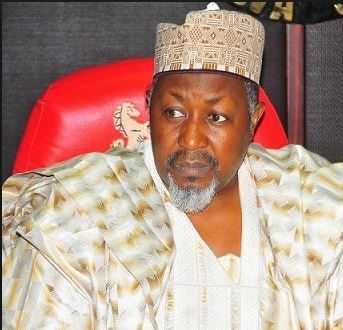 Though he was a member of parliament under the auspices of the PDP for more than ten years, he is now one of the founding fathers and financiers of Social Democratic Party (SDP) in Jigawa state, where he is also the party’s governorship candidate.With the lingering crisis in the APC in the state, he is seen as one of the major contenders to take over from the incumbent governor, Badaru in 2019. This is against the background of rumour that the SDP and PDP are currently having series of meetings on possible alliance. Between 1999 and 2015, Hon. Jumbo represented Kazaure/Roni/Gwiwa/Yankwashi federal constituency in the House of Representatives where he headed various committees, including National Population, Army, Defence, and Intergovernmental Affairs among others. In this interview with Saturday Vanguard in Dutse, Jumbo, who is one of the longest serving federal law makers bares his mind on various issues, including his role in convincing over 370,000 PDP supporters to decamp to APC in the state shortly after President Buhari was elected. Why did you quit PDP for APC shortly after the 2015 elections? We joined APC on December 20 2015 primarily to continue to serve our state and also to reunite with our family, friends and political associates. I stayed in APC for two and half years before moving out. But what shocked me was that after joining APC, I was not even privileged to own a membership card. When we joined the party, we thought we were joining a family, friends and political associates but as time went on, we were told that we were PDP guys. There was never any occasion that anybody referred to me as APC member and even during meetings they said ‘these PDP people should not be accommodated’. I even told the leaders in that party that all I wanted was to be carried along in major decision making. After staying there for two and half years I understood that I was not wanted We contributed towards the development of the state but no matter how much you love a thing and how much you want to be part of it, you can only identify with such if you are wanted. If you are not wanted and you are pushed aside, there is nothing you can do than to make decision for yourself. And one of the major or difficult decisions we had to make was either to return to PDP or remain in the APC. No matter what we tried to do, we were seen as PDP members and that made us very sad and so frustrated in the whole affairs. What we could do in the circumstance was to move out and we decided to take a neutral path where everybody will be on the same level, as equal partners. You led 370,000 of your supporters from PDP to APC in December, what is therefore their fate now? You have been part of successive governments in Jigawa state since the return to democratic rule in 1999. You offered advice and made contributions in building the state. What new thing do you have to offer that you did not offer successive governments? I have two things going for me; my antecedents and my integrity. This world is not all about material things but what you are able to do when you are in a certain position. And to me I have served my people in Kazaure emirate comprising four local governments in the national assembly for 16 years. There are some people, even if you go to their father‘s house and build something, they will still say you have not done anything. I have tried as much as possible to be a leader and to do what is required of leadership. Leadership is all about patience and resilience. And I tell anybody who wishes to join SDP to go and check my antecedent. They should judge me from that point of view. After 2015, I had no intention of contesting any election even for free. But I am a human being, I have to protect my integrity, I have to protect the integrity of my people and I need a platform to do that. Whatever God has destined for you, you cannot ran away from it. I am even more afraid of winning the election than losing it because if I win the election, I know the kind of burden I would be carrying. Some people have argued that your purported entry to the APC was just for a show up and that was why you did not even have a membership card. I did not join APC for fun because even when the people in government were begging us to come to APC, I told them to give me some time to consult widely. That was why when we left PDP, we created history by assembling about twelve serving governors, ministers, secretary to the government of the federation, national working committee members of the party, the Vice President was represented and the speaker of the House of Representatives was here. I have won elections five times out of the six times that I contested, so if I am playing to the gallery what do I want to gain from it. I challenge anybody who claim to have done any favour for me personally since I entered that party to date to come out and say so. At the appropriate time, I will show recordings of meetings where people were offering all sorts of things and I told them, no we were not coming for any favors or privilege but to help in developing and building a Jigawa state of our dream. I have made my name, contested election and I knew I was not coming to APC to contest for any election or ask for any position. I won’t be a commissioner in Jigawa state neither will I be secretary to the government, so they don’t have any position to give me. What are your plans and programmes? In Jigawa they are mostly agrarian engaging in subsistence farming, so they can‘t get anything from farming and the only place they turn to is government. That‘s why you find everybody in Jigawa state is a hostile politician because unless you go close to government you don‘t get empowered and that‘s what I want to change. It’s all about poverty and even crime which is the last one. Crime will come down by at least 70-80%, as there is no community without crime. But if you empower people and they have things that they are doing, nobody will come and bang your door and point gun at you. How are you going to face the challenge of incumbency factor and what are your chances? They only use incumbency to scare people away from trying to do their best for their people. In fact, if incumbency were a factor I wouldn’t lose election in Kazaure in 2015. When people are contesting elections they beg the Almighty to help them, but when they win elections they believe they are powerful and have the resources and being an incumbent nobody can touch them and they take God out of the equation. The only incumbent I know is Almighty God, His reign will never diminish in any way and I will give you instances in 2003. The elections took place between Goje and Hashidu in Gombe state, in Kano, Shekarau contested against Kwankwaso while in Jigawa, it was between Lamido and Badaru. In these instances, incumbency didn’t work for the sitting governors, so it has never bothered me. And on the issue of my chances, they are quite clear and bright. In Jigawa today they depend on money and power of incumbency but for me I rely on the movement of people and trying to find something better than what is happening today. I‘m very confident because I have a clean mind with a clearly focused agenda and I believe God and people will be on my side. One thing I do in my federal constituency which other politicians don‘t do is that I raise my hand during my campaigns and say ‘oh Allah if I’m doing this for my selfish interest please don‘t give me’. So I don’t see incumbency factor as a threat to my aspiration, God gives power to whom He likes at any time and He has already written in gold who will be the next governor of Jigawa state and even Nigeria‘s president in 2019.